This is just something I wanted to draw your attention though, but I do not necessarily have an opinion on. These are two situations I have been in personally to illustrate the point. At a fantasy fair I saw a very energetic fursuiter that was really playing out his role and I found it so inspiring that felt compelled to give them a warm hug. 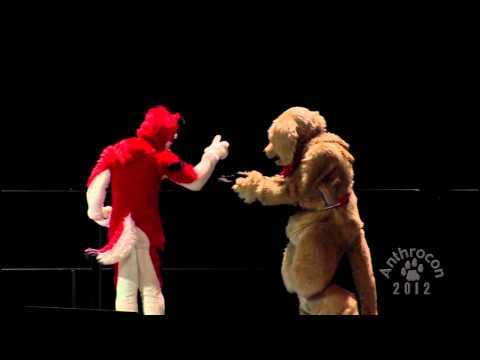 While I approached them I vagualy registered to people looking at the same suiter saying something among the lines of: "So... do you think he is a lizard or a dinosaur or..."
And without giving it much thought (the suiter had wings and the badge he whore gave away more about them): "DRAGON!" and spread my arms for welcoming hug. Immediate reaction, he was happy, pranced over and we shared a hug. Where I heard the guys behind me facepalm: "Oh god.... Of course, how could I be so stupid." I felt sorry for the guys. How could they know? I encountered a fire red fursuiter which was very tall (and for the danger they might and will recognize me here). I like his fursuit and thought about taking a picture. So I called out his species, long ears, small muzzle, cute face. "BUNNY!" And... I was wrong. He pointed at his badge and said he was a squirel. He looked very heartbroken and from his demeanor I guessed it was far from the first time that happened. I apologized and got permission for a picture. Apologized some more, but I guess that damage was already done. He wasn't to happy when he walked off. I really felt bad about it and it didn't easily leave me. I don't think their is an easy solution for this and you are happy to discuss any if their are. But maybe you all have come across similar situations. Aww, that's so sad to hear. I guess it's better to just wait until it becomes clear what kind of fur/scalie/other someone is. To non-furries it's one thing to explain, but towards other furries- You'd think they would know, and if they don't you might think: Darn... is my design that bad? I can totally relate to the feeling, but honestly, sometimes it's just not that clear. At least, not to me. Because (thankfully) we combine every possible color and design on to every possible species. Which are already altered because mostly they have enhanced proportions already. Maybe 1 little detail could clearly give away if it is 1 of sometimes 3 possibilities and that one detail could be very clear on a badge or drawing. But sometimes could be less clear on a suit, because it is so hard to emulate in a real world objects like clothing, props and suits. So, yea if you are not sure it is better to just ask or wait then to just blurt it out. Could be an awkward conversation (because yous till admit you couldn't give it out from the suit) or not a conversation at all, because most furs do not talk within their suit (which I can very well understand) because it would break the suspense. That's why I think their no real total solution. The safest thing I could think of is letting the whole species out of the equation till you had the chance to confirm in a later conversation. 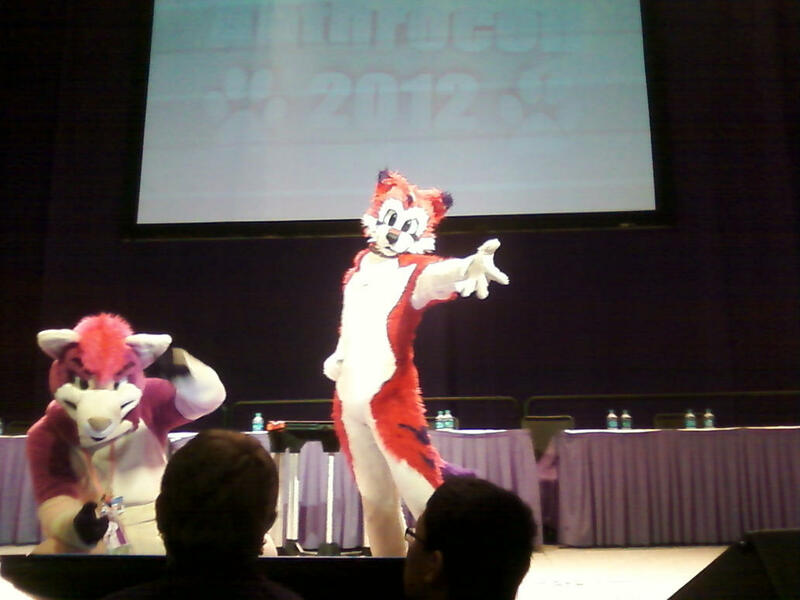 You interact with the suiter. Later you can ask their spotter or someone that knows the suiter. Or the suiter themselves when they show up without the suit and with a bit of social engineering skills you talk about their character (you are already interested in their character so... why not ask more about them) and at one point you just ask "why did you choose this species and what kind of sub species is it?" Which would not give the person the idea you had no clue what species (or which of the choices you could think of) his or her character is. However... I really really enjoy the spontaneous side of it. I enjoy the reactions you get when not talking to much and just use your voice to in a silly and entertaining way announce something you would like to do. Just shouting: "hiiii or hello" is just not the same. My friend actually tried the "wrong determined species" thing today. We were in an amusement park for a cosplay walk, where my friend suited and me & two others took turns on being his handler. His fursuit's a nice big light yellow/yellow-ish beige feline with black spots. Leopard/cheetah. Easily. But throughout the day only 1 person called him a leopard. Everyone else shouted either lion or tiger (who have ever seen a tiger with spots??) and one even called him a polar bear. What polar bear is yellow with black spots? None of us took it with a heavy heart though, as we were just laughed about how so people couldn't get his species right, although he has such a simple design. I've also been called wolf, bunny, coyote, dog and cat in one of my older suits. I just find it funny that no one seems to get the species right. And yeah, I rarely can tell is someone is a dog, wolf or whatever.. Especially with bright unnatural colours it is hard to tell if it's a dog, wolf or coyote. Toony canine in pink and green could be anything. With a very realistic suit, it is easier. I got used to "chicken" and "duck". Also, lame jokes about chicks. On the other hand, there are kids who suddenly shout "Mine! Mine!" and try to stick fries into my beak. Has anyone worked out what Sardyuonis , I cant decide between canine, feline or vulpine? Has anyone worked out what Sardyuon is , I cant decide between canine, feline or vulpine? He has a long muzzle and bushy tail. So I would definitely say either canine or vulpine. Ear markings could be from a red fox. The muzzle markings are more panda then they look like the fox. Belly markings are more like the fox. I'm guessing he is a red fox/panda hybrid or creation of his own with inspiration from all over. I can't site sources, can't find any. So I'm not going to make any absolute guesses. It was frustrating at first but now I just accept it because very few furs know or have even heard of pangolins. I think the more a species and their anatomy are unknown (for example the easy difference between a cheetah and a leopard are the "Spots" and most clearly the weep-strip) the easier it gets to get confused. I for one thought Masada is a snowleopard at first sight (he is just a white cheetah). So far I've been lucky enough that no-one's been wrong. Then again - Kyuubi (fromNaruto) is so well-known that people already know he's a fox, and others have guessed correctly based off of his orange color even though his muzzle is more dog-like in its appearance on my suit. Recently on a suitwalk I was identified as a cat by a bystander. OK if people think that I'm a wolf or fox but a cat? Really? Grandma: "I washed your t-shirt with the rabbit on it"
Me: "T-shirt with a rabbit? I don't have a t-shirt with a rabbit"
*Sees her holding Eurofurence 20 shirt.